Born on November 2, 1732 in Talbot County, Maryland, John Dickinson became known as the Penman of the Revolution for his series "Letters from a Farmer in Pennsylvania" which argued the cause for American liberty with eloquence and grace. 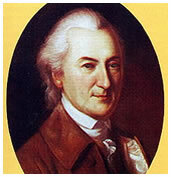 Dickinson served in the militia as an officer in the Revolutionary war and served as a Continental Congressman for both Pennsylvania and Delaware, and was a celebrated delegate to the US Constitutional Convention of 1787. Born in Maryland on his family's tobacco plantation, Dickinson was the great-grandson of Walter Dickinson who was a first generation immigrant from England to Virginia. Walter Dickinson arrived in Chesapeake Bay in 1654 and bought 400 acres of land to start a plantation he named Croisadore which meant "cross of gold". In addition, he also purchased 800 acres in what became Kent County, Delaware. Croisador plantation passed through generations to eventually settle on John Dickenson's father, Samuel. Each generation succeeded in growing the family plantation so by the time Samuel inherited the land, it spanned 2500 acres, crossing five farms in three different counties. Samuel, in keeping with family tradition, increased his landholdings exponentially, eventually owning over 9000 acres of land, and adding the Kent County property which he purchased from his cousin, expanding that domain for over 3000 acres itself. This Kent County land became the home to a new plantation which he named "Poplar Hill". Both plantations were largely profitable and were managed by slave labor which produced tobacco as well as wheat and corn. As a result of these acquisitions and growth, the Dickenson family grew to be extremely wealthy. John's father Samuel married Judith Troth in 1710 and together they had nine children. Smallpox claimed the lives of the three oldest sons who were being educated in London. Upon the death of Judith, Samuel remarried Mary Cadwalader in 1731, who was the daughter of a well-known Philadelphia Quaker named John Cadwalader. They had three sons in the following few years. John was educated at home by his parents rather than abroad, as well as receiving additional education by recent immigrants specifically hired for his educational needs. Dickinson found himself drawn to the larger city of Philadelphia despite his love for his family home of Poplar hill. At 18, John was sent to study law under the tutelage of John Moland in Philadelphia. By 1753, both John and his father realized the need to travel to Londan to further his legal education, and despite the loss of three other sons, Samuel agreed to the journey. John spent three years at the Middle Temple, and was admitted to the Pennsylvania bar in 1757, where he began work as a barrister and solicitor. In 1774, John became one of the delegates to the First Continental Congress, as well as the Second Continental Congress from 1775-1776. He collaborated with Thomas Jefferson in writing a Declaration of the Causes and Necessity of Taking Up Arms, with Dickinson arguing that Americans were "resolved to die free men rather than live slaves". He also wrote the Olive Branch petition in a last effort to restore peace with King George. Dickinson's objective was not independence or revolution, but rather reconciliation with England. As a life-long Quaker, John felt strongly that disputes should be settled without resorting to violence. After the Declaration of Independence, Dickinson was appointed an officer in the Pennsylvania militia where he led 10,000 soldiers in the protection of New Jersey against a British attack. Towards the end of his life, Dickinson was elected again to the State Senate in 1793 but was only able to complete one year of service before resigning for health reasons. He worked tirelessly in the abolition movement and donated a large portion of his considerable wealth to the "relief of the unhappy", and also published two complete volumes of his political works in 1801 before his death in February of 1808.